U.S. Patio Systems and Home Remodeling proudly offers bathroom remodel services in St. Paul, Minnesota, and throughout the Twin Cities region. Owned by home improvement professional Craig Dauffenbach, U.S. Patio Systems and Home Remodeling is a bathroom remodeling contractor that you can reliably turn to for top-quality products, great service, and incredible value for every dollar you spend. We are committed, first and foremost, to helping our customers enhance their homes through professional bathroom remodel services and a worry-free remodeling experience. 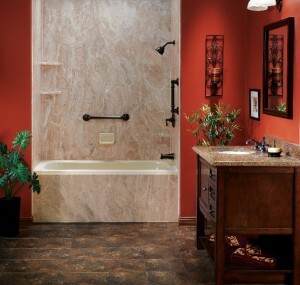 Every installer on the U.S. Patio Systems and Home Remodeling team is a veteran bathroom remodel pro. In addition to being factory-trained and -certified, all our installers are extensively background-checked before being invited to join our company. In fact, U.S. Patio Systems and Home Remodeling is an Authorized Service Provider for The Home Depot, meaning that we have been handpicked by The Home Depot to provide home remodeling and home repair services to its customers. Authorized Service Providers all have outstanding customer ratings, extensive industry experience, and better warranties than other contractors. If you need to remodel a bathroom in your home in or near St. Paul, MN, then contact U.S. Patio Systems and Home Remodeling today.